Because I work at home, my weekday lunch is usually leftovers from the previous night. In a young, professional city like DC, there are so many lunch places that I hear about but I never get to go. Recently, my husband took a day off for no reason at all and we decided to have lunch somewhere we can't go on weekends. There were several candidates including a PORC food truck which I am dying to try but unfortunately, they did not open that day. 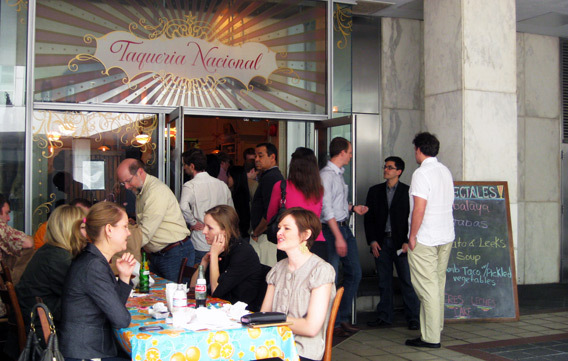 Our plan for the rest of the day was going to the Gauguin exhibit at the National Gallery of Art so my husband suggested to go to Taqueria Nacional which is nearby. There were probably 30 people waiting to order but the line was fast and we got our food within 15 minutes. There is basically no seating at the restaurant (everybody must eat at their desks in the winter) but since it was an amazingly beautiful early March day we took our lunch and sat at the park across the street. 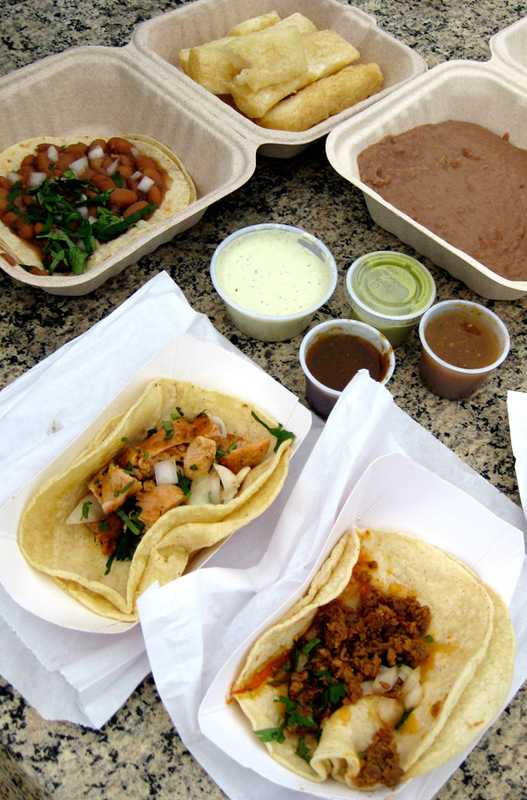 Our lunch choices were chicken taco, pork taco, bean taco and yucca fries. When we opened the lunch, we thought we might have had too high expectations just by looking at the meal. But after one bite, we realized what all the fuss is about. 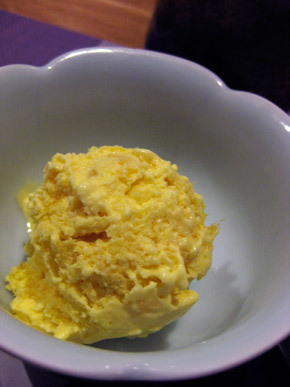 The simplicity highlights the flavor. In particular, several different kinds of homemade spicy sauces were wonderful even though I am not a big fan of hot sauce. Of course all three tacos were fantastic but the best item for me was the yucca fries. I just could not stop eating them. The whole lunch including two bottles of water was $14. You can't ask for a better deal than this. We were jealous of everyone who gets to eat here every day. 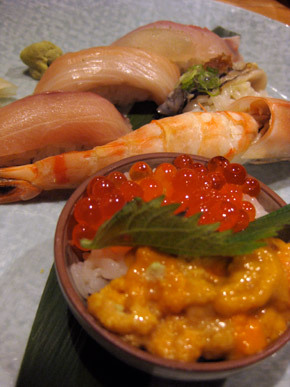 I have tried many Japanese restaurants around DC over the last few years. Many of them are not very good but several of them are worth returning to over and over. Here are my picks. 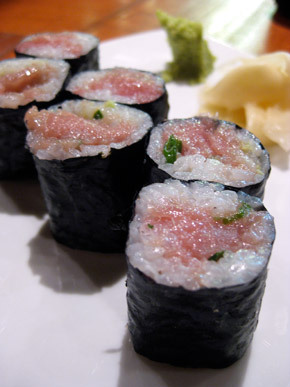 It may be an obvious choice but I like Sushi Taro for sushi. The last time I ate at Sushi Taro was also my first time since they changed the interior and menu format. 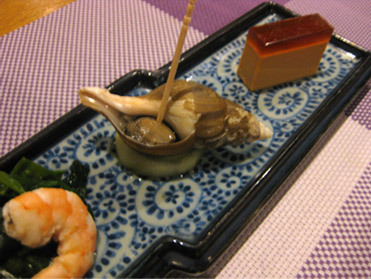 We tried their mini sushi tasting (sushi kaiseki) and a mini traditional tasting (kaiseki) for $58 each. You can also choose the full course which is $80. I found the mini was plenty of food and I don't think I could have eaten any more than that. Contrary to rumor, you can also order a la carte - you are not obligated to choose one of the course menus. Everything was well prepared and very good qualitywith only one exception: they over cooked all the shrimp dishes which was very disappointing because I LOVE shrimp. Also, serving miso soup alone in the middle of the course menu seemed a little bit strange unless it had a substantial ingredient in it like clams or lobster. One of our favorites was the snapper broth. It was an umani bomb with a delicate, light body. And needless to say all the sushi were delectable. Everything was perfect: the quality of the fish, the balance of portion of fish and rice and the perfectly cooked and seasoned rice. 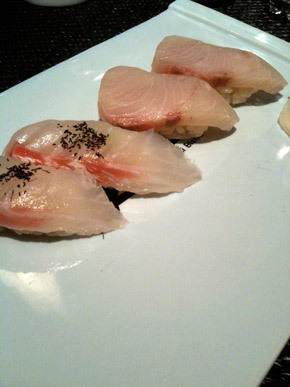 Now that I know that you don't have to order the tasting course, I will go back to Sushi Taro more often. 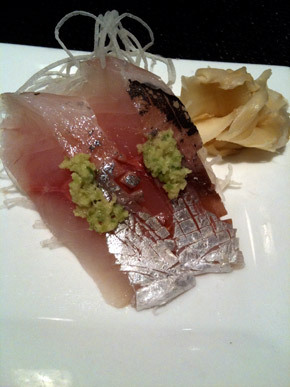 Although I pick Kaz Sushi Bistro as a runner up for best sushi, I want to highly recommend their cooked dishes. 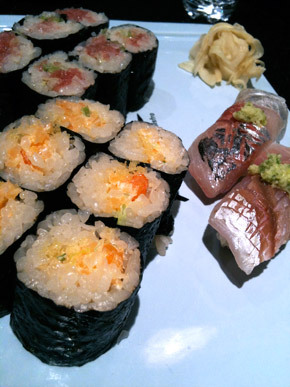 I liked their nigiri very much but my husband was not so happy about their rolls. 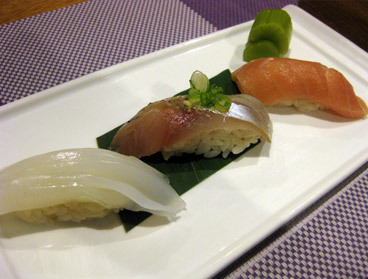 Their nigiri was not so delicate as the one from Sushi Taro but the fish were fresh and good quality. However, we both enjoyed the other items on the menu very much. I LOVED all of their hot dishes from their special menu. The fried oyster with potato was incredibly scrumptious. 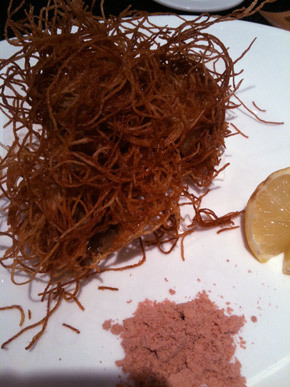 Very thin potato was wrapped around the plump, juicy and creamy oyster. 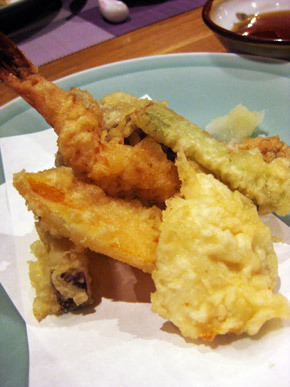 It was so addictive.The Nagoya-style Tebasaki (wing) is fried sweet and spicy, a very traditional Izakaya food. Their version was as good as the one I had in Japan. The secret is chef Kaz is from Nagoya! I can guarantee you would love this dish. 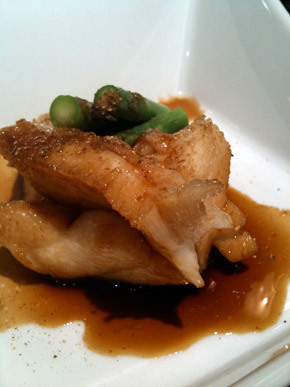 Lastly is the amazing braised Chilean sea bass. I think it is their staple special menu item so please try it if you go there. You won't regret it! 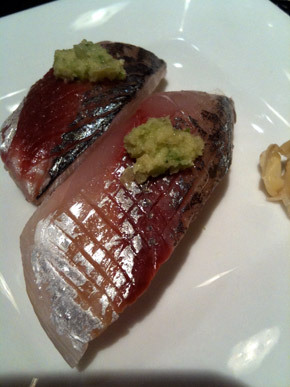 As you could see, we ordered many Aji (Spanish mackerel). 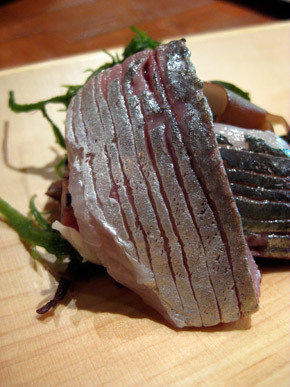 I went there when it was Aji season and it is my most favorite fish. They made me very happy. 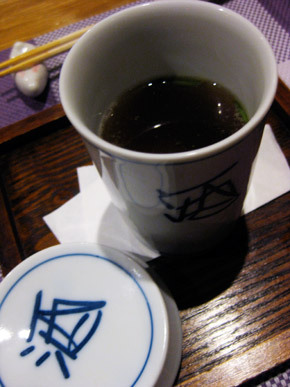 Every single item they served were carefully crafted in a very traditional way just like back in Japan. I really enjoyed their fried fish (the only minor complaint I had was the fried fish was quite salty). 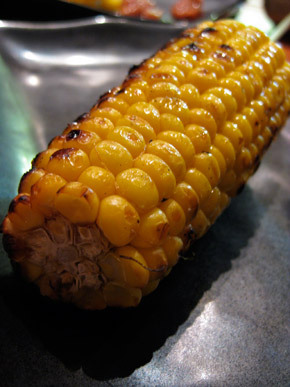 It was so crispy and you could eat the whole thing from head to tail. 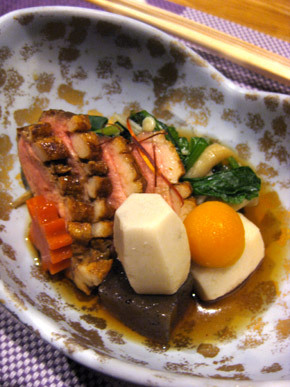 Japanese cuisine is not only about food. The presentation is very important. We often say you eat with your mouth and eyes and Makoto understands that. If you go for dinner they serve a wonderful testing menu for $60. By the way, Makoto has a very strict rules like no cell phone while you are dining, you have to wear business casual (only for men) and you have to wear their stocking if you come with bare feet (you have to take off your shoes when you enter). Nothing unreasonable - just worth mentioning. 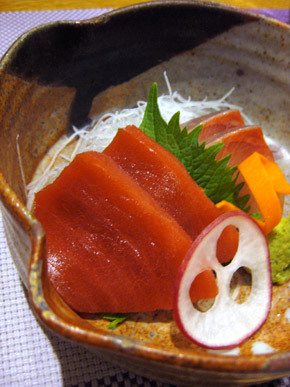 Kushi has the most modern and attractive decor like you can find in New York or in Tokyo. I really love their large open kitchen with the counter around it. 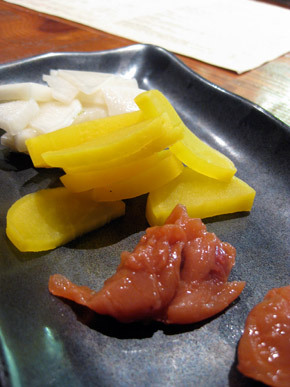 It is a typical robata-yaki restaurant style. 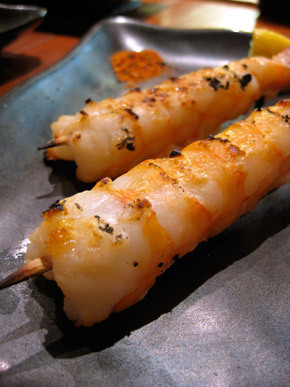 Traditionally, the chef in the kitchen serves you the grilled food with a long pole and if Kushi would do it, that would be really cool. But even without that, the restaurant looks very stylish but very laid back at the same time. Therefore, I think it is a great place for a date. There is also a separate sushi counter at the other side of the restaurant which also looks nice. 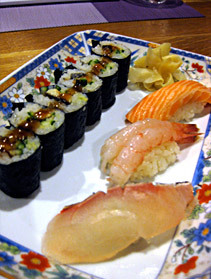 Kushi's specialty is robata-yaki (Japanese grill) but they serve high quality sushi as well. I should try several more times to make my final judgement about their sushi but my first impression was very positive. 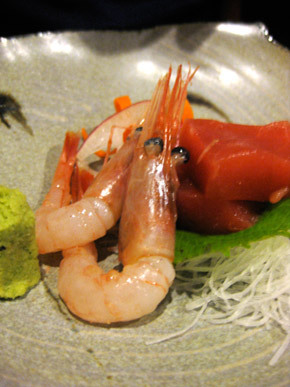 We tried several items from the grill, small plates and a few sushi and sashimi. 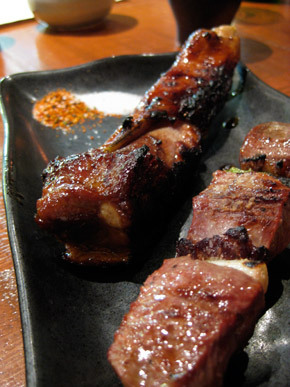 The best dish we had was buta kakuni (braised pork belly) and negima (chicken breast and scallion skewer). I make buta kakuni at home all the time and when I make it I braise it for a long time until the color of the meat turns brown from soaking up all the braising liquid. 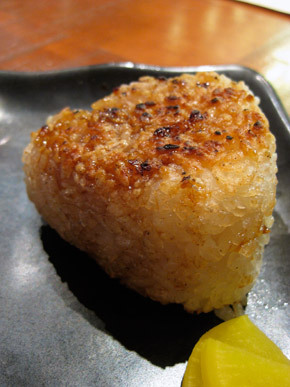 Although kushi's kakuni does not seem to have been braised that long, it was extremely tender. 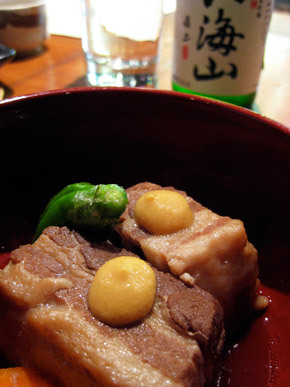 I have heard that their buta bara (pork belly skewer) is also wonderful. 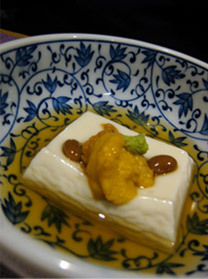 There are many items that I wanted to try. A daily selection of whole fish, duck thigh and mahogany quail stuffed with duck sausage will be on our next order. 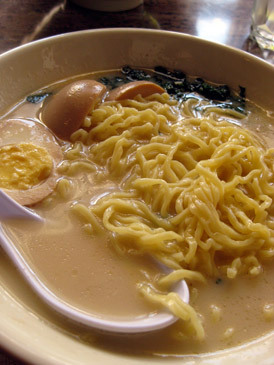 The only ramen shop we used to have in DC was Ren's Ramen in Bethesda but it closed in summer 2010. It looks like they are looking for a new home and I hope they will re-open soon. Last summer, I saw a new Ramen shop - Ramen Dandan's - ad in the Japanese free newspaper and I had to try out. When I got there, I realized it is not a stand alone shop. It is just part of the Satsuma Japanese restaurant or more precisely, they just have ramen on their menu. It is kind of false advertisement, I thought, but it does not really matter if they serve good ramen. I got a tonkotsu ramen (pork bone soup base) and my friend had a miso ramen. My tonkotsu was rich and creamy and I liked it a lot. However, they serve it with a very thick wavy noodle. Tonkotsu is usually with a very thin straight noodle so I thought it was odd but the soup was good. 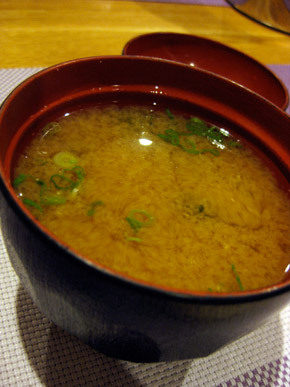 The miso was ok but it was not so special, I thought. 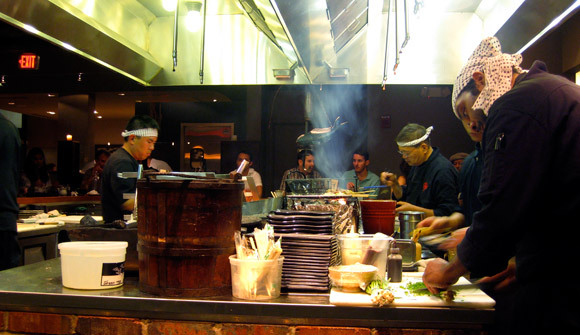 I have heard about a new ramen restaurant on H street called Toki Underground. 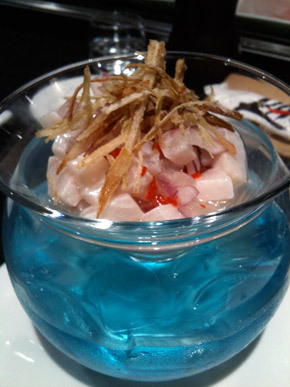 It looks like the place has a Japanese pop culture theme but the owner, Bruner-Yang, is Taiwaneese. I assume their noodles would be more Chinese style but I can't wait to try out. 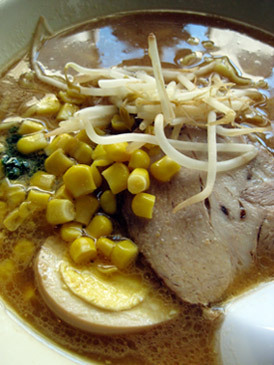 I've also heard that there may be a new ramen place in back of the Verizon Center next year. 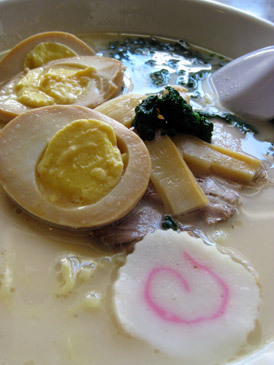 Until Ren's will reopen, Den Den would be my choice for Japanese ramen for now. But really I'm still waiting to award this prize. 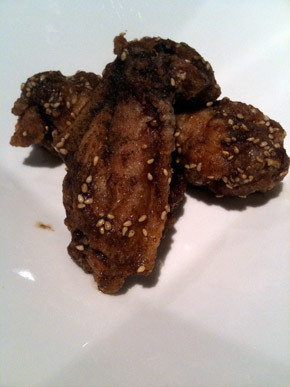 Tachibana in Mclean and Taco Grill in Bethesda are still in my list to try out. Are there any other places that I should try?